Paddy Russell, who has died aged 89, was a television pioneer. As the first female floor manager employed by BBC television, she worked on a number of landmark productions, before graduating to become an admired drama director. Her adoption of "Paddy", a diminutive of her name, Patricia, helped her to negotiate the patriarchal landscape of the BBC of the 1950s - seeing her name on a call sheet, without having met her, most of the crews assumed that she was male. She faced resistance; one manager told her that no woman could ever run a studio floor "like a man". Her response was that she had no intention of doing so - she would run it like herself. Gender trailblazing aside, her most enduring legacy - even though she claimed no understanding of special effects - may well be her four Doctor Who stories, in the 60s and 70s, among them some of the series' most highly regarded adventures. She began her association with Doctor Who in 1966 with the now lost serial The Massacre. The lead actor, William Hartnell, took a dual role, as the Doctor and as a scheming abbot, in a doom-laden tale about the slaughter of Huguenots in Paris in 1572. For Invasion of the Dinosaurs (1974, with Jon Pertwee), Russell and her then partner, the cameraman Tony Leggo, rose at 4am and shot without a permit in order to capture eerie sequences for the atmospheric opening episode set in a deserted London. Pyramids of Mars (1975) is one of the programme's all-time greats and features alien robots disguised as Egyptian mummies stalking around a country estate to chilling effect. Tom Baker played the title role, as he did in the much admired Horror of Fang Rock (1977), which kills off its entire guest cast when a shapeshifting alien besieges an early 20th-century lighthouse. Paddy was born in Highgate, north London, to Bertie Russell, a clerk in the purser's cash department of P&O, and his wife, Alicia (nee Quinn). The second world war - and Bertie's reserved occupation - caused the family to relocate to Croxley Green in Hertfordshire, but not before Paddy had spent some time in the West Country when her school - the Joan of Arc convent school - was evacuated there from Rickmansworth. Determined to be an actor, she was able to overcome her father's fierce objections to the idea only by including a stage management element in the acting course she enrolled for at the Guildhall School of Music and Drama in London. While there, she was hired by the BBC producer Michael Barry to play a member of the jury in his television production of Toad of Toad Hall (1950). Six months later, he used her again, in The Insect Play (1950) - she performed a solo, taking on the role of a schoolchild, and helped with stage management. She found herself drawn to TV, ultimately choosing a three-week assignment behind the scenes in the fascinating new medium over the chance of acting in a 10-week repertory season in Ireland. For a decade she worked under the BBC director Rudolph Cartier on such groundbreaking works as Nigel Kneale's Quatermass serials and his controversial 1954 adaptation of George Orwell's novel 1984 for the BBC Sunday-Night Theatre series of live TV plays (after the first of its two performances the BBC hired extra security because of complaints about the subject matter). Cartier was a formidable figure who mounted large-scale productions and Russell's no-nonsense professionalism was greatly needed to stand up to him, to control the large casts, tricky effects and complex action. She appeared as herself in Cartier's production of the Holocaust play Dr Korczak and the Children (1962). Based on a true story, the piece opens with Russell calling for silence in the studio before telling the actors that they will be performing without costumes or scenery. The conceit of her first directing assignment, Return and Answer (1961), was that each week a historical figure would be subject to interrogation by the broadcaster and writer Edgar Lustgarten. The cast that this fledgling director assembled was a testament to the high esteem in which actors held her and included Andre Morel], Maxine Audley, Rosalie Crutchley and Sir Donald Wolfit. Russell's other work for the BBC included the soaps Compact (1963) and The Newcomers (1966-67), and episodes of Z-Cars (1967-76), Pere Goriot (1968), Little Women (1970), The Moonstone (1972) and The Omega Factor (1979). Having worked in Yorkshire on such diverse fare as ITV's Emmerdale Farm (more than 50 episodes between 1976 and 1980) and the quiz show 3-2-1, she accepted an offer of regular work directing the regional news programme Calendar, broadcast by ITV Yorkshire. She made a permanent home in Oxenhope, near Keighley, and later moved into radio news and training courses, but by the late 90s she put most of her energies into rescuing and housing as many stray cats as she could. APA 6th ed. : Hadoke, Toby (2017-11-16). Paddy Russell. The Guardian p. 37. MLA 7th ed. : Hadoke, Toby. "Paddy Russell." The Guardian [add city] 2017-11-16, 37. Print. Turabian: Hadoke, Toby. 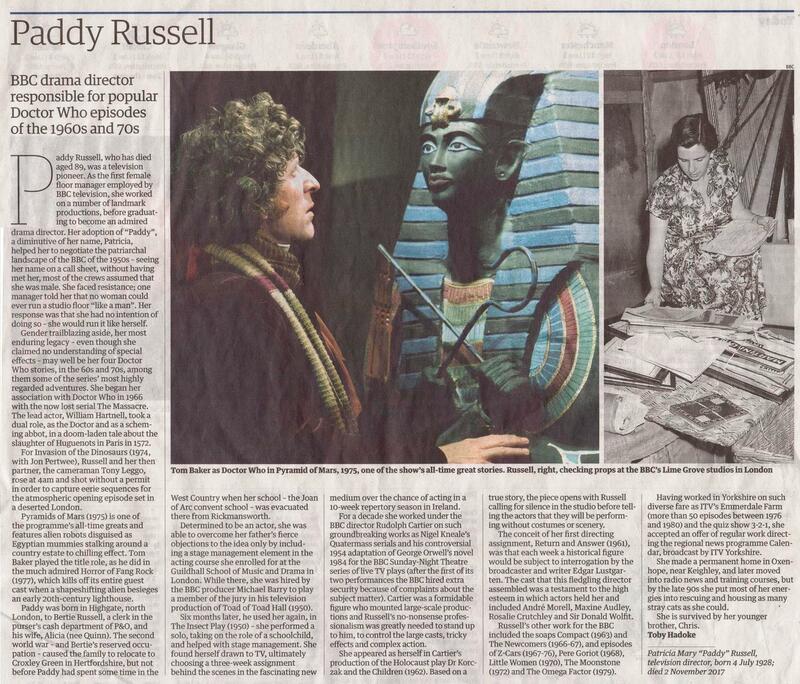 "Paddy Russell." The Guardian, 2017-11-16, section, 37 edition. This page was last modified on 22 March 2019, at 01:04.